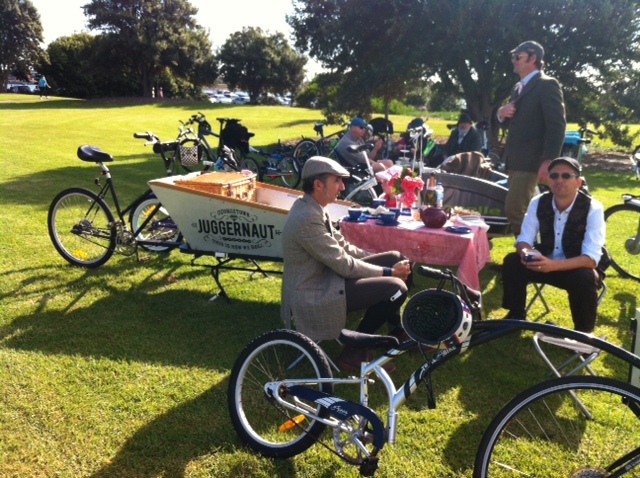 The Juggernaut has since undergone a transformation to incorporate the formidable unfolding picnic table, which attracted picnicking crowds, and a new paint job which was so new that I could still smell the fresh paint at the Tweed Ride last Sunday! See it again here in all its tweed glory! 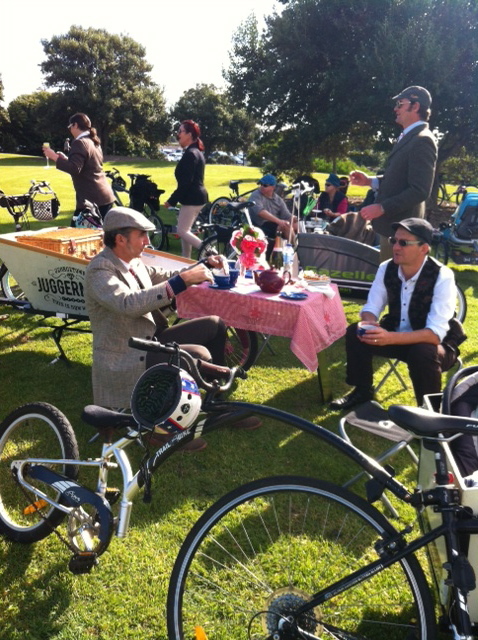 This entry was posted in Uncategorized and tagged Cargo bikes, newcastle, Newcastle Tweed Ride, quirky bike, unusual bikes. Bookmark the permalink. I showed them pictures of what I wanted and passed them beers at the appropriate times. I did paint it, however. It is indeed a fabulous bike! Did you give them detailed specifications for geometry Michael? You’re lucky to have such talented men in your family. 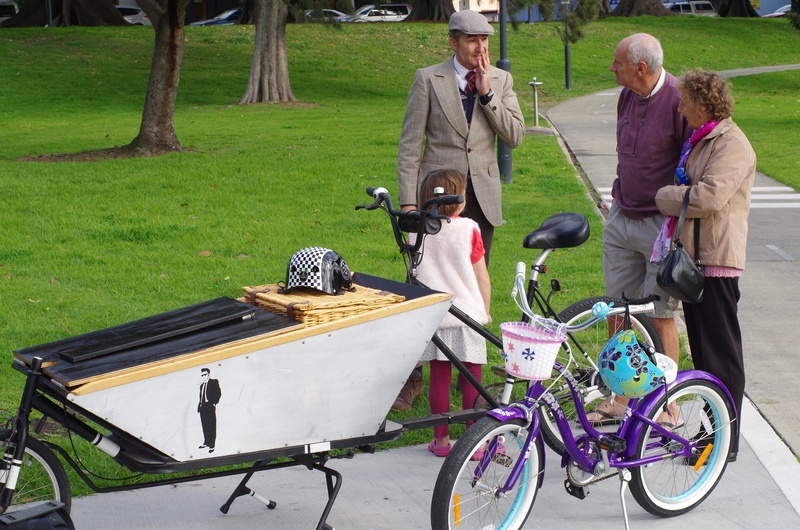 There were no detailed specs or measurements, we’d never actually seen a real bakfiets in the flesh before we started. The donor bikes dictated the geometry and the cargo area is so big because the steel tube comes in 3m lengths so we made it 1mx0.5m to avoid cutting. Everything is scavenged except the seat, the steel tube and some components I had to buy for the 7 speed hub someone gave me. I also had the wheel built around that hub and bought a brake cable for a tandem to use on the front brake. It’s a work in progress. I visited your blog with lot of beautiful and sophisticated pictures: its seems you make photos like a painter. I appreciate this kind of poetry. I bet you’re a friend of clouds. Thank you very much! I’m glad you liked it. I’ve not thought much about it before, but I think I would consider myself a friend of clouds. I’ve added another picture to this post, showing the other side of the box, which was sent to me by Peter, the New Recyclist.